The weather here in Knoxville lately has had me smiling from ear to ear, y’all. It kinda feels like fall, but the sun just continues to pop out every day against the clearest blue skies, and that makes my heart so happy … so with that said, I decided to go frolick in a field of weeds. Halloween is almost here y’all! And, I don’t know about you, but I love any chance I can get to be a little festive. I’ve totally fallen in love with this trendy tee brand called Southern Made Tees, so I decided to style a few of their festive Halloween tees for a SPOOKtastic night shoot. 😉 This year, I am keeping it totally relaxed and casual with my halloween costume (while handing out candy to the kiddos). 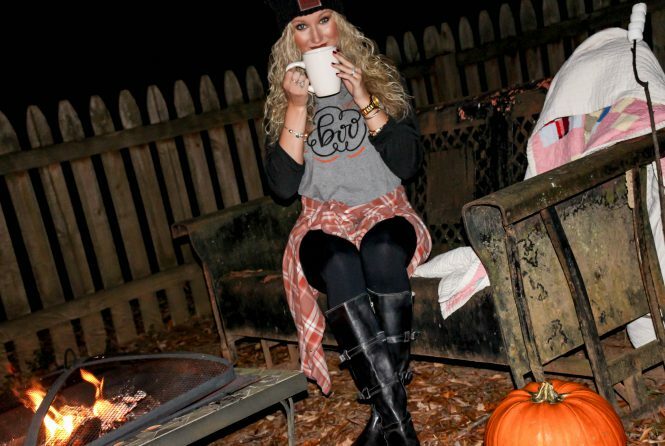 It will consist of my ‘BOO’ tee, a beanie & a flannel … + a mug of hot apple cider as my accessory of the night! Does anyone else’s closet look like a black and white overload? … Yeah mine, too. But, I mean, HOW can you not love wearing black & white?? (My hubs may provide me with some reasons because he LOVES when I wear color) BUT … you literally cannot go wrong with b & w. It’s so classic, chic, stylish, and classy. We’ve all been there … well, at least if you live in Tennessee you have been! The ‘in between seasons’ stage. In the mornings, it’s pretty chilly (or if you’re like me, it’s FREEZING) and by the time 3:00 rolls around, it is in the 80’s (sometimes 90’s). So … the big kicker is: WHAT DO I WEAR?! The struggle everyone can relate to. Happy Sunday, pretties! Tonight, we’re talking all things trendy. It has always fascinated me how fashion evolves and styles come back around, and this year … some of my faves are BACK! Fashions (& trends) will always fade. Some will come back around, and some will evolve into a better version of ‘that trend’ in the future. That is one of my favorite things about fashion – seeing how certain trendy looks will come back around and incorporating those new trends into my own personal STYLE. Happy Monday & happy fall, y’all! This weather in East TN right now has me all kinds of excited. Yesterday, I went up to the Smoky Mountains with my mom & couldn’t have asked for a better fall day … I could definitely get used to these cooler temps & these changing leaves (anyone else with me??? ), although we all know how Knoxville weather is and it could possibly snow or be 97 degrees tomorrow. Anyways … the cooler breeze in the air has had me craving sweater weather, booties, & of course, caramel apple cider from Starbs (you may love or hate me after saying this, but I’m just not a PSL gal … love putting pumpkin in my coffee though so no worries, I’m still on the basic train 🙂 ). Leather and fur have been and always will be two of my favorite things to wear. Add some flared, bell-sleeves & a thigh high boot to the combo, and now we’re really talkin’. I love the edgy, yet chic style that this look gives. I’m Peyton, and I am so excited to welcome you to my fashion and lifestyle blog, love ‘n’ labels! 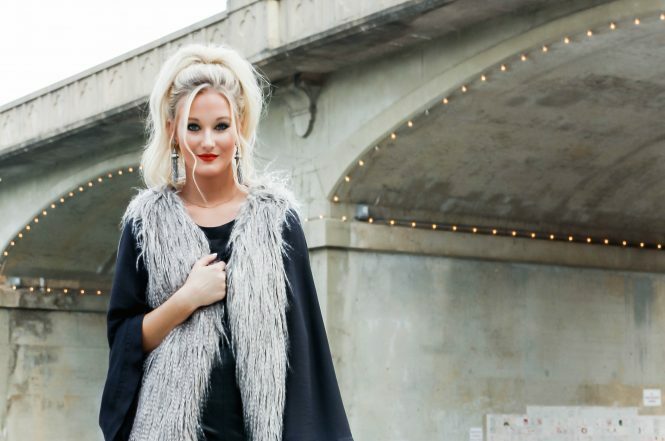 On this blog, I will share with you the most current fashion trends, wardrobe styling tips, glam and beauty tricks (that I have learned throughout tons of trial & error), traveling adventures, and plenty of personal stories about love and life in the South.